It'd be nice if we had an anthem, let alone a parliament! Thank you for your letter dated 9 July 2006, regarding the establishment of an English Parliament. Your letter has been passed to the Constitution Directorate as the lead area on devolution matters. In relation to your first question, the Government's devolution policies were designed to strengthen the Union at a time where the people of Scotland and Wales felt removed from the decision making process. This placed a strain upon the Union and saw a rise in the support of Nationalist parties. The establishment of the Devolved Administrations has ensured the people of Scotland and Wales have benefited from policy initiatives that have tackled the specific problems within those countries. This has helped the people of Scotland and Wales feel closer to the decision making process and support for Nationalist parties as flat lined. Both these illustrate the success of devolution. With regard to your second point, the Government does not agree with your assertion that there is a groundswell of opinion for the establishment of an English Parliament. In June 2006, a YouGov opinion poll commissioned by the Campaign for an English Parliament and the English Democrats, showed that over 75% of those surveyed did not support the establishment of an English Parliament. A subsequent MORI poll in July 2006, commissioned by the English Constitutional Convention, bore out a similar view. In addition, the establishment of an English Parliament would threaten the Union - a Union that has enabled Britain to play a leading role on the world stage. An English Parliament, with the same powers as the Scottish Parliament, and running alongside the existing UK Parliament would lead to the creation of two parliaments and governments within one. This would mean that a UK Government, elected on a UK mandate, might find itself unable to deliver key policies on which it had been elected. This would not provide a sound basis for effective government in the United Kingdom. Such a situation would be unsustainable, and will lead to the creation of a separate English Parliament and Government - and the break up of the Union. 41 per cent said they favoured an English Parliament 'with similar law-making powers to the Scottish Parliament' and Only 32 per cent said they were happy with an unchanged House of Commons. Presumably this means that 27% are either in the 'don't know' or 'English votes for English MPs' category. That that is so is reflected by the fact that there is no demand at all for devolution to England or the English MPs only being able to vote on English issues. Under first past the post (which our current government seems to favour) that means that the English parliament idea is the winner. He also argued that an English Parliament would inexorably lead to the break up of the UK (but a Scottish Parliament would not). John Humphreys: Yeah, but, but you're ignoring the anomaly, and it is a clear anomaly isn't it? You gave reasons why there should not be an English Parliament (namely that it would be bad for the Union), but you did not explain why the Scottish Parliament is not bad for the Union. As such I do not feel that you addressed these issues and so am turning to you in the hope that you have had time to deliberate upon your earlier statements. One point of particular interest was that you said "That that is so is reflected by the fact that there is no demand at all for devolution to England or the English MPs only being able to vote on English issues." This was interesting, as this was in direct contradiction to that exact demand from Oliver Heald. The poll says that 41% favour an English parliament with 32% favouring an unchanged house of commons. Presumably the rest are in favour of "English votes for English MPs" or are "don't know". 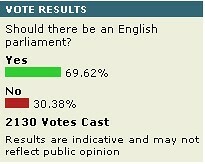 If this were a general election, under "first past the post" the English Parliament proposal would be a clear winner. Given this, have you revised your view that there is no demand at all for devolution to England? We now have a situation where you have admitted that anomalies exist, though you did not indicate how you would solve them. We also have a situation where you have stated that there is "no demand" for a solution and this has been demonstrated to be incorrect. I would be interested to hear what your next step will be in resolving this anomaly in our constitutional arrangements. If you do not deem that a solution is needed, then I would ask how a Scottish parliament can be justified and yet an English parliament with similar powers cannot â€“ and why one would necessarily lead to the break up of the Union and the other would not. So, it's time for the world cup to start, and everywhere is adorned with England flags, the St. George Cross. This is fine and dandy, nothing wrong with that. Reclaim the flag from the far right and all that. The flag-waving even provoked a debate on the West Lothian question on Newsnight (though the Scot MP seemed rather disingenuous to me, the phrase 'having your cake....' sprung to mind). ... why do some people feel the need to fly the flag with the word 'England' across the horizontal red stripe. I mean, don't they know? In related news, people have been warned not to fly the English flag in Wales, why is it that there has never been a need to warn against flying the Scottish or Welsh flag in England? Today is the National Day for England, St. George's Day. Compared to St. David, St. Patrick or St. Andrew, I expect very few English people to notice. Scots, Irish and Welsh have an obvious sense of identity, whereas the English do not in quite the same way. In the six nations tournament, each country had it's own anthem, and England got... 'God Save the Queen' - the Anthem for the UK as a whole. Similarly, England is the only nation in the UK without any control of it's own destiny, we have no parliament. Historically as the most dominant country in the UK we did not define ourselve by reacting against 'the other' and so outward displays of national pride can be seen as distasteful by the English. It's too showy, too 'in your face'. Visiting the USA can sometimes give that 'over the top' feeling! The English, on the whole, tend to prefer understatement. Indeed, unthinking national pride is a bad thing for lots of reasons, not least of which is that it suspends the critical faculties and doesn't allow one to consider the view of 'the other'. The flag itself (like the Union Flag) has been appropriated by racists and bigots - patriotism can so easily slide into nationalism. 'My country right or wrong' is potentially very dangerous. As a result of the flag being appropriated by bigots I have grown up not feeling an affinity for this flag. It's very weird, but a pretty safe rule of thumb is that if someone is walking toward you carrying a Union or English flag, they're probably not someone you're going to want to stay on the same side of the road for. It's quite a terrible thing. I recognise it. I resent it. Yet the association is still there. The same is sometimes true for the Union Flag. I googled around a little on the subject, and came to this nice post which was made a year ago. I just don't feel any affinity for the symbol of a group that I have very little to do with. To be either proud or ashamed of being English or British seems ridiculous to me; you didn't have anything to do with the World Cup, or the British Empire, or any of that, how can you feel proud or ashamed of something you didn't do? My sense of responsibility is limited to how I affect the community as a current part of it, and so I am somewhat ashamed of, say, how asylum seekers are treated, because I could do more to stop it. But that never goes as far as me feeling a personal affinity to any flag. As I mentioned, England is the largest country in the Union, whereas historically one could imagine the other countries in the Union threatened by England, and hence with a need to demonstrate their own identity. For many English, the words 'English' and 'British' are (unfortunately) synonymous. The same is not true of, for example, the Welsh (note to Americans, a Welshman is usually happy to be called British, but never English!) If you take a British person at random, chances are that they will be English. Though England is dominant in the Union, the other countries in the Union have a disproportionate power. For example, Scottish MPs have been known to tip the balance of a vote on a bill which does not affect Scotland. Similarly, like it or not, more votes in England went to the Tories in 2005 than to Labour, not only do we have a labour English majority in the house, but this is augmented by MPs from the other parts of the Union. These MPs can vote on matters which do not affect their own constituents, but do affect English ones. So why this post at all? Primarily it's about the future, in the UK, England has laws made for it by Scottish MPs, elected by Scots, and those laws have no role in Scotland. This can't be just - and over the long term is likely to divide the Union due to a growing sense of injustice. I don't want to Union divided, I like the Union - but the solution is not to have a second class of MP as proposed by the Tories ('English votes on English matters'). We need a UK parliament (probably seated at Westminster), which has true jurisdiction over UK-wide law (including Scotland and Wales), we need national parliaments which vote on national issues - for each of the countries that make up the Union. Currently Wales has an 'Assembly' with much fewer powers than the Scottish Parliament, and England has no seperate voice. A seperation of bodies would clearly allow English versus UK matters to be clearly defined, if it's in the UK parliament it's a UK wide issue. If it's not, it isn't. What goes where would be clearly defined. Our piecemeal approach that we have at the moment cannot be sustainable, and that is bad for the Union. If raising the profile of the symbol that is the English flag can help that end in some small way, if we can reclaim the flag from the bigots, then so much the better. At the moment the flag still has unfortunate associations as for so long it was appropriated by thugs. I do resent this, and hope that we can claim it back for civic purposes, removing that association. Even if successfully reclaimed, it'll probably still remain that flag waving for the sake of it will, for many English, seem, well, 'tacky'. It will also remain the case that most of the world (and some English) won't understand this. I would be interested to hear what your next step will be in resolving this anomaly in our constitutional arrangements. If you do not deem that a solution is not needed, then I would ask how a Scottish parliament can be justified and yet an English parliament with similar powers cannot â€“ and why one would necessarily lead to the break up of the Union and the other would not. This letter has been drafted for sending off to Harriet 'no anomalies' Harman. Ten months ago I wrote to you after an appearance on "Question Time", a letter to which I never received a reply. To refresh your memory, there was a question about constitutional anomalies. At the time I was surprised that as a Constitutional Affairs Minister you said "What anomalies?". This was surprising given the disparity between, for example, England and Scotland and the fact that one has the trappings of nationhood, and the other does not. The Lord Chancellor gave reasons why there should not be an English Parliament (namely that it would be bad for the Union), but he did not explain why the Scottish Parliament is not bad for the Union. As such I do not feel that the Lord Chancellor adequately addressed these issues and so am turning back to you in the hope that you have had time to deliberate upon your earlier statements. One point of particular interest was that the Lord Chancellor said "That that is so is reflected by the fact that there is no demand at all for devolution to England or the English MPs only being able to vote on English issues." In addition, since the broadcast there has been a poll on the BBC News website running at over 5 to 2 in favour of the English Parliament. As I write there have been some 2752 votes with over 72% in favour. Also, in the introduction to "Any Answers" on Saturday, Jonathan Dimbleby said "We have been deluged with calls and emails on this issue." We now have a situation where the Lord Chancellor has admitted that anomalies exist, though he did not indicate how he would solve them. We also have a situation where he has stated that there is "no demand" for a solution and this has been demonstrated to be incorrect. I would be interested to hear your views on these matters and, in particular, how a Scottish parliament can be justified and yet an English parliament with similar powers cannot. This was the Interview from Friday 10th March 2006 on 'The Today Programme'. Apologies for any transcription errors - please comment if you find any! I've taken the time to transcribe it as I plan to quote from it when I write a letter or two in the future. I previously wrote to Harriet Harman (no reply received), and Number 10 who referred me to a vote in January 2004, where a particular solution was rejected, but the problem remained. Anyway, on to the interview. JOHN HUMPHREYS: 10 past eight. When historians judge the Blair Government they'll certainly consider devolution. Scotland has it's own parliament, Wales it's own assembly and the United Kingdom is demonstrably different because of it. But England is unchanged and that raises profound constitutional questions, not least why should a Scottish MP be able to vote on English matters when a English MP can't vote on Scottish matters, and a Scottish MP can't vote on Scottish matters, devolved matters, himself unless he's a member of the Scottish parliament. The solution many believe is a Parliament for England. The Scots, the government, have never been keen on the idea but now it's about to rule it out forever. "Not today, not tomorrow, not in any kind of future we can see," that's what The Lord Chancellor, Lord Falconer will say today, and he is with me. But let's hear first from his shadow on the Conservative benches Oliver Heald, good morning to you. OLIVER HEALD: Good Morning. Comment: This reveals an error by the BBC, which could leave them open to allegations of bias - they did not have anybody on that supports an English Parliament. Personally I see that as nothing more than oversight. OH: Er, oh, the Economic... The Economic and Social Research Council. OH: And er they they've found four very interesting findings which I think help our argument. The first is that there's a strengthening in the feeling of English identity since devolution. The second is that the English have different policy agendas from the Scots in areas such as Health and Education and next week in the Education bill we may well see it go through because of the votes of Scottish, er, members of Parliament. The third is the failure of English development policy and they're making the point that there hasn't been a proper look at England as a whole, with London and the South East going ahead, but the rest of the country having disparities. And then the thir - the fourth point that they make is there is a lack of proper arrangements between the UK government and the nations of the UK. So what we're saying is 'look, let the English Members of Parliament from the English constituencies sit down together and decide together what's best for England in the context of the issues dissol-devolved to Scotland'. JH: But wha-wha what could they decide? I mean what powers do you think they or wha (stumbles) What changes could they make? OH: Well, for example, I mean, on development we've set up this week a, a task force under Michael Heseltine that's going to look at the way in which in our English cities, and we would hope to develop this in other parts of the UK with agreement there, but er, how we, how we make our cities work well for those who are still disadvantaged there. JH: But that's still pretty modest stuff and it doesn't address this fundamental issue. OH: Health and Education. Both issues which are dealt with in Scotland and Wales er, where we think that, er, there are different policies in England. I mean, for example, the research shows that a lot of the English are prepared to look at ideas of independent, not for profit, er, solutions in Health and Education where as this is not popular in Scotland and Wales, and so I think there is a distinctive English agenda which we could develop together. JH: Lord Chancellor, Good Morning. JH: A distinctive English agenda, do you accept that that exists? LF: Yes, I can see that there could be a distinctive English agenda, and indeed the effect of devolution has been that in Scotland and in Wales different policies have been pursued because that's what devolution has allowed. But I think the criticial question is what most preserves the Union. The reason for devolution was that the Scots and the Welsh felt that policies could be imposed upon them for which there was little or no support in Scotland or Wales, that's why devolution was popular. Once you create.. Comment: And we now have a situation where a government which, like it or not, earned fewer votes than the Conservatives in England - but a majority of seats, can impose legislation where there is little support in England. It can do this with the help of Scottish and Welsh votes where such legislation may not have an effect. (I am not referring to a specific piece of legislation, but rather to the principle). LF: It just got through in Wales in a referendum, it got through very very substantially in Scotland, the effect of devolution is to allow a distinctively Scottish and Welsh agenda to be pursued. In England there's 80% of the population, there's just over 80% of the members of parliament. There is absolutely no need for the sort of protection for England which comes for the Scots and the Welsh by having their own parliamentary assembly. Comment: Until one remembers that Scottish MPs and Welsh MPs can hold the balance of power, and that they're overwhelmingly labour. JH: But if they feel there is a need, and if for instance, you say there's no need for protection, but if we find the education bill going through bec.., an education bill that affects English voters in a way that it doesn't affect Scottish voters, if it goes through because of Scottish votes, that's a democratic - not just democratic deficit, a democratic absurdity. Comment: Well done, John, let's see how he answers THAT! LF: I think the one thing that one can be sure of is that the education bill will not go through only because of Scottish votes. Comment: Ah, the crystal ball response. Denying the possibility will occur, and sidestepping the general point. JH: (speaking over LF) Absolutely not, but that's the point. LF: Well anyway, let us see what happens next week. That seems to be the least likely of all alternatives. JH: Nonetheless it remains a possibility and that is the point, it's the principle involved. Comment: Well said, Lord Falconer. Can you please address this issue now? LF: but because so many of the population and so many of the MPs are from England it is inconceivable that political parties would not pitch their appeal to the English. Therefore the chance of it happening is very, very slight. Comment: Shall I take that as a 'no'? LF: That that is so is reflected by the fact that there is no demand at all for devolution to England or the English MPs only being able to vote on English issues. Comment: This is a clear nonsense, given that for the statement to be disproven there would only need to be one voice demanding devolution for England - and he had just followed Oliver Heald demanding English votes for English matters. As I write the BBC poll on this page has had 2559 votes, with over 71% voting yes. If he claims a slip of the tongue, meaning to say 'little' demand, then I'd want to see evidence - perhaps a referendum. Citing the rejection of the elected regional assembly in the north west doesn't mean that the English don't want a parliament, it can be taken to mean that they simply don't want to be sliced up into regions. LF: There was real demand for, for example, a Scottish Parliament. No such pressure in England. Comment: Even if such a statement is correct - which I doubt - the problem of the anomaly remains, and this can only make the pressure grow with time. JH: Yeah, but, but you're ignoring the anomaly, and it is a clear anomaly isn't it? Comment: Well, it's progress from Harriet 'What Anomalies' Harman's position last year. Does that mean you're going to address it? LF: and I think the right question to ask yourself, how do you deal with that anomaly in a way that most promotes the Union? And I believe if what you have is two tiers of MPs, some only entitled to vote on English and others not entitled to vote on English Issues, what you do is promote seperation. It's one step toward an English parliament. Comment: That's a no, isn't it? JH: Well then you'd... well why NOT have an English parliament? LF: Because England is 80% of this country it would be by miles the most powerful institution, more powerful almost than any national parliament. Comment: This is patent absurdity - the westminster parliament would be more powerful than the English parliament, as it is more powerful than the Scottish parliament. Also, comparing the English and Scottish parliaments is not meaningful as they would have different spheres of influence. LF: You'd have, you'd have a federal government dealing with certain issues, you'd have a parliament for 80% of the population dwarfing all other institutions. Comment: There he goes again. I fail to see why that is, in and of itself, a problem. JH: Does, does it not bother you that the notion of Britishness, and I use the word advisedly because it is a word that was used on this programme by Professor Charlie Geoffrey who carried out research for this very organisation, the Economic Research Council, that that is disappearing? Comment: This doesn't address the question at all. LF: Nor does it in any way diminish my commitment to the United Kingdom, you're Welsh! LF:You don't feel remotely incon... there's no inconsistency in your feelings by feeling both Welsh and British. LF: There's no evidence that they resent the fact that there is no English Parliament, indeed quite the reverse. Equally feeling profoundly English or Scottish is not remotely inconsistant with having a strong feeling about the need to continue the Union. Comment: This is silly on so many levels. Firstly the pedantic point - I resent it, I'm English - point disproved. ('Little' evidence would require a survey and would not be so easily refuted... absolutist statements are easily disproved unless they are 100% correct). The BBC poll on the topic is running at over 2 to 1 in favour. Putting this to one side, the point about continuing the union is not relevant to the English parliament. Falconer has NOT demonstrated why and English parliament is necessarily bad for the Union whereas a Scottish parliament is not. Indeed, to my mind it should be parliaments for all the countries of the Union - or none at all. Inconsistency can only damage the Union in the long term. It also is putting up a straw man, the main point cannot be defended, and so a false premise is presented which is knocked down in the stead of the real argument. I support an English parliament because of the Union, not in spite of it. I would be strongly opposed to breaking up the Union - however, I don't think that within the Union we should have disparities in terms of representation. This is why I do not support the existence of the Scottish Parliament (for example) if there is no English Parliament - it should be both, or neither. In the same way, this is why I support electoral reform - someone living in a safe seat has a less important vote in an election than someone in a marginal. Indeed, in every election I have ever voted in, the local result has been a foregone conclusion, I have always lived in safe seats - and I have never been courted by candidates. JH: All right. This is one of the things that you changed, one of the big things that you've changed. Something else that you said you would change fundamentally is the House of Lords, the way it's made up, and indeed you have made changes. One of the changes you've made, it now seems, is that if you want to buy a peerage you can do so, under this government. LF: And indeed what we've done in relation to the Lords, or the... and with the agreement of the Lords is that there's an independent committee chaired by Lord Stephenson who is a cross bencher, not Labour or Conservative, though every political party is represented on this committee and they vet all those people who may come into the Lords and that's an entirely appropriate way of determining whether or not propriety is observed in relation to people going to the Lords. JH: Let me give you the findings of another independent commission, the Power Enquiry, chaired I believe by a Labour person if I'm not mistaken, indeed a Scot! JH: Indeed. This pointed out that every donor who had given more than one million pounds to Labour had received a knighthood or a peerage. LF: Well, as far as the propriety of going to the House of Lords, as far as the propriety of getting honours is concerned there are independent bodies that scrutinise whether or not it's a proper appointment, and that is how it should be. JH: But it is the perception of the thing. If I know that I can get a peerage by bunging you a mill.. I might do it! I.. I'd rustle up a million pounds from somewhere and buy a peerage! LF: ... from any honour. Comment: At no point did he say 'Yes', let's not let facts get in the way. Carry on. LF: .. then what you need is some body to ensure that there is propriety in the honour or the appointment to the Lords, but you should not be prevented because you, for example, believe that Labour should be supported over the years it was in the wilderness. LF and JH speak simultaneously. LF: That should not debarr you in any way at all... JH: ... but does it not bother you... doesn't..
LF: ... from being a peer. JH: Doesn't the perception bother you that here we have a situation that if you give a million pounds to the labour party you're guaranteed a peerage or a knighthood? Guaranteed! This is what the Power enquiry itself has said. JH: Every single donor who has done it... let's not look at what you believe to be the case, let's look at the facts of the case, as you as a lawyer might say. Every single donor who's given more than a million smackers to Labour has got either a peerage or a knighthood. JH: And it doesn't bother you that, to go back to the question, that everybody who's doled out a million has got something as a result of it? That doesn't bother you? JH: The perception of it? JH: who say all I've got to do to get into the House of Lords is to give Tony a million quid and I'm in. LF: You have a choice, John. You either say people who give money to political parties can't get an honour. And I don't think that'd be right or sensible. JH: What about erm, the... and I don't want to talk about Tessa Jowell because that as far as you're concerned, you'll say that's done and dusted. But what about the fact that it's not right for the Prime Minister to be judge and jury in his own court? LF: Well, he is the person that appoints ministers. He is the person accountable to parliament. There is no possible basis for any suggestion that somebody other than the Prime Minister should decide whether a minister should stay or go. Of course, he can seek aid from the Cabinet Secretary in relation to the facts, but ultimately he is responsible. Look at what people said when the independent standards board decided that the democratically elected Ken Livingstone should be suspended from office for four weeks. Ultimately it is the electorate who decide. That means the Prime Minister must decide who are his ministers and who are not. JH: Sir Alastair Graham, Chairman of the standards committee wants an independent official to advice ministers on their code of conduct. Surely in the interests of transparency that's what should happen. LF: There is an independent official who can advice on those matters that is the cabinet secretary, but ultimately the decision must be taken by the Prime Minister or there isn't proper accountability. They finished the interview with a discussion about the story of the man that was fined 50 pounds for dropping junk mail into a litter bin. Clear Anomaly Admitted - with an mp3 - this needs a flash animation to sell it (and psossibly a few more quotes edited in), shame I don't have flash! How is it possible to hold so many contradictory ideas at one time? So to have an English Parliament would threaten the breakup of the United Kingdom, but having a Scottish Parliament and Welsh Assembly does not? 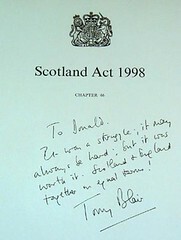 Falconer also acknowledges that "The argument for devolution was that the Scots and the Welsh felt policies could be imposed upon them for which there was little or no support in Scotland or Wales" - precisely the same arguments the proponents of an English Parliament use now, only with "England" in place of those two Celtic nations. Indeed, Scots votes have swung it for the government on a number of occasions now. Still, at least Tony and Charlie are being consistent in their claims that they can't introduce two tiers of MPs. Although that rather fails to answer the question "what are MSPs and Welsh AMs if not second-class MPs, exactly?" "The lord chancellor today rubbished claims that peerages were for sale." His rebuttal follows a recent inquiry that found that every donor who had given more than £1m to Labour had received either a knighthood or a peerage. But Lord Falconer insisted that did not mean people could buy peerages. 'Absolutely not, no,' he said on this morning's BBC Radio 4 Today programme. 'You are not guaranteed a peerage.'" So peerages are categorically not for sale, and especially not for a price tag of £1m, which will, empirically speaking, buy you a peerage with 100% certainty. Absolutely wonderful. I heard both of these go out on the radio, and meant to post on them, before posting I did a quick search to find two posts that had heard one of these each... made the comment I wanted to make... and had already linked to each other. Funny how people think in similar ways. Both of Falconer's pieces of Doublethink can be heard in the one interview, linked to from this page, there is also an mp3 - both of these links may well be removed by the BBC in a few days. Edit: See my earlier post on this interview. Heard on 'The Today Programme' as I woke (hence what follows is not word for word). Lord Falconer is to make a speech today where he will say no to an English Parliament, "not today, not tomorrow". The logic presented by the reporter was probably best described as tortuous. In Scotland and Wales, the Scottish parliament and Welsh Assembly were 'the first port of call' for representation. However, should England have a parliament to represent it's interests this would inevitably lead to a 'federal britain'. The reporter neither relayed why this would be a neccesarily bad thing, nor did they say why the same argument should not be applied to Scotland, for example. They went on to report that Falconer will argue that in any event, the UK parliament is sovereign (in Scotland too), and so that's good enough in England. Why isn't it good enough in Scotland? I do agree that the Conservative solution (English votes on English matters) is not terribly good - it leads to all sorts of problems (e.g. bills which in some respects affect all of the UK, but in some areas only affect England). The only viable and stable solution I can see is a seperate English parliament, if an item is before that body then it's is, de facto, an issue for England. Any issue before the UK parliament (at westminster) is then a UK-wide issue and applies to ALL of the UK, including Wales and Scotland. A cynic might ponder on the observation that devolution only seems to be a good idea in areas where Labour stands a good chance of dominating. London has the mayor, Scotland (Labour/Lib Dem coalition), Wales.... Northern Island is a different kettle of fish, admittedly. In England, it's true that Labour holds more seats - but they lost the popular vote at the last election. The tories got more votes than Labour. Could it be that a seperate parliament for England would highlight this and they're arguing from a purely party political standpoint? Surely not! Update: In the 8:10 interview (which will be available on the 'Today' website for a week or so), Falconer said that there was no demand at all for an English Parliament. A rather absolutist statement which is disproved by even a single voice.... He responded to the thought that the Education bill would only pass due to Scottish votes as 'unlikely'. Thereby completely sidestepping the point that under the current constitutional settlement it is possible for bills which don't affect Scotland to be passed due to Scottish votes. Update: The BBC have a 'Have Your Say' discussion on this issue. Update: Iain Dale posts on this same topic here (and gets a lot more comments, mutter, grumble).... The CEP makes reference to this interview (and links to this site, hmm, no trackback - I wonder if it got junked, I'll have to look).... and I made a later post based on this interview. If this is genuine, and it looks like it might be, then it is an absolute scandal. "England and Scotland together on equal terms"? Either Blair is completely unaware that he has set up an equality in the United Kingdom, or he intended to create an English Parliament and has sat on his hands for seven years. It would be interesting to ask the Prime Minister what he meant when he wrote that. Unfortunately since there is not an election anywhere in sight it is likely to be four years before a member of the public close to asking him a left-of-field question like that. The political interviewers are extremely unlikely to ask anything a bit awkward like that (even on one of the extremely rare occasions where he's interviewed at all). For those who didn't see the excellent edition of Question Time last night, it is available here for roughly the next seven days. When it gets to issues of constitutional reform: Harriet 'What anomalies' Harman starts to wriggle her way out of the questioning at around the 12 minute 30 mark. Last night, Harriet 'What anomalies' Harman appeared on Question Time, where electoral reform got a good airing. Boris was on top form, though his idea of 'electoral reform' amounted to pushing the boundaries around a bit, thereby completely missing one of the main points. Last night you appeared on "Question Time". There was a comment about constitutional anomalies. In an astonishingly unaware comment from the Constitutional Affairs Minister you said "What anomalies?" Please allow me to explain just a few of them. In the UK, the government launched into a system of constitutional change, despite your statement on Question Time that this is not something to be rushed. Your Government emasculated the House of Lords without having adequately thought through what would take its place, or consulting the public on a question which affects our governance - one item in a manifesto does not make a consultation. To date, the House of Lords question still remains unresolved. Any resolution should build in the ability of the Lords to be independent. My ideal would be three member constituencies, with one member elected via STV every three general elections. Thus the individual Lord is not continually looking for their next election and can scrutinize legislation without personal worry for their post. Your Government also started on a process which weakened the UK government by devolving power to Scotland, Wales and Northern Island. Whether this was a right move or not is incidental at this stage. The situation as it stands is that, for example, Scottish MPs can vote upon matters which affect English constituents but not vice versa. I fully accept that the UK parliament is for the whole of the UK - and so it should be for UK matters. Nevertheless it is fundamentally unjust that English constituents can be affected by votes from Scottish MPs and the reverse is not true. I do not personally want the UK to split up, but this imbalance can only grow with time - for the long term stability of the UK, balance is needed. A failure to address this matter appears to be driven purely by concerns of party above country, especially given that the Conservatives won the popular vote in England - something which personally I'm not thrilled about. Given that yesterday you were not aware of anomalies, I hope this letter has helped you to recognize some of them. I wish you well as you begin to address them. The otherwise excellent (and scary) BBC Electoral seat predictor for the UK election has subdivisions for Scotland, Wales and N. Ireland, but not England. Why not? Even though England is governed in part from Scotland, Wales and Northern Ireland (all with national bodies), it would be good to see a breakdown for this part of the UK. The subdivisions are for the westminster vote, not for the various assemblies and parliaments. I've asked them this question and will relay any reply I receive - even if it is my error! I note that your excellent 'seats predictor' has subdivisions of the UK offered. These are Scotland, Wales, and Northern Ireland. Unless I've read it incorrectly, the subdivisions all relate to the Westminster vote and not to the Scottish parliament, welsh assembly etc. Why is England not represented seperately as well in this case? I look forward to any response, and will update www.murky.org to reflect your reasons. This is a direct link to the film mentioned here.